Today in Williams County history (February 1, 1880, 138 years ago): The former Pioneer Methodist Episcopal Church on South State Street was dedicated. The Pioneer Methodist congregation constructed a wooden frame house of worship at the southwest corner of State and Church streets circa 1860. In 1879, the congregation moved the frame building and began construction of this brick church on the site. The church cornerstone was laid on July 24, 1879, and the structure was formally dedicated on February 1, 1880. This facility served the Pioneer United Methodist Church for nearly a century—until the congregation completed a new house of worship on Baubice Street in 1975. The Williams County Historical Society dedicated an historic marker at the former Pioneer United Methodist Church on October 6, 1991. The historic 1879 church building was razed in February 2000. 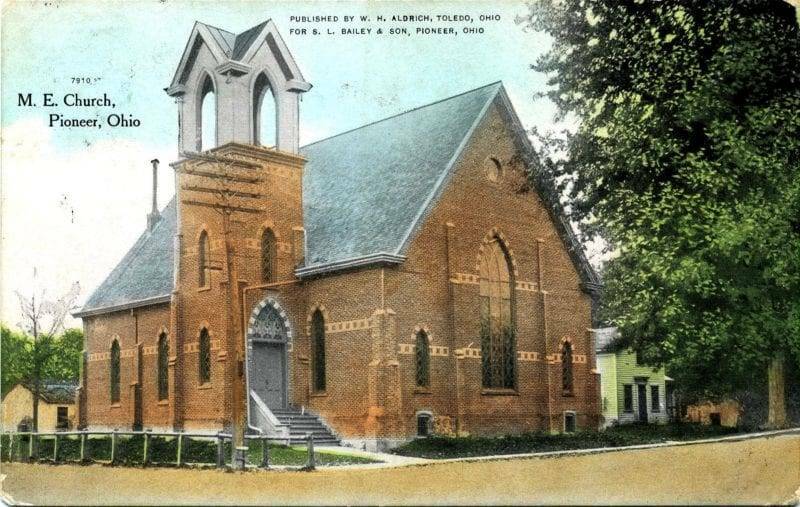 This circa 1908 vintage image of the Pioneer United Methodist Church is from the Kevin Maynard collection. Be the first to comment on "(1880) – Former Pioneer Methodist Episcopal Church (Pioneer, Ohio)"